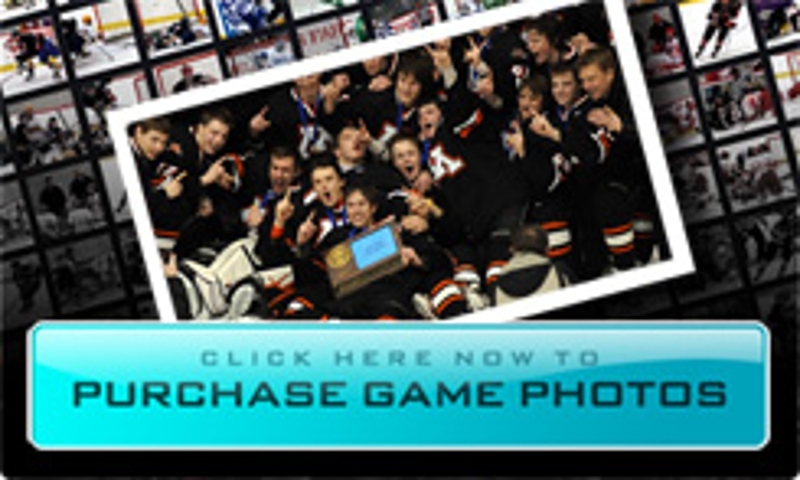 Moorhead enjoys its Section 8AA title with fans (Photo by Tim Kolehmainen). 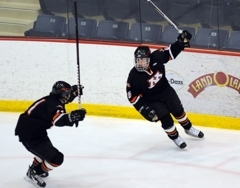 Logan Ness (26) celebrates after scoring just 2:48 into the game, a goal that turned out to be the only one Moorhead would need (Photo by Tim Kolehmainen). Nic Oxton had been waiting for the moment all season. Minutes after Moorhead upset top-seeded Bemidji, 2-0, in the Section 8AA finals at Ralph Engelstad Arena in Thief River Falls, Oxton stood in the center of the Spuds’ locker room. 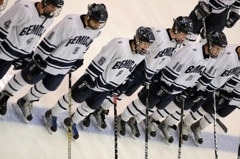 The senior held a newspaper clipping over his head while his teammates cheered him. 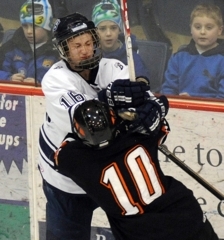 The article recapped last winter’s section final loss to Roseau, in which the Spuds were the top seed and denied a state tournament bid by the underdog Rams. Oxton was featured prominently in the accompanying photograph, kneeling on the ice with his head bowed and a defeated sag to his shoulders. “Ever since last year, with that moment of sitting on that knee there in the picture, it was the worst feeling in the world,” said Oxton. Moorhead displayed the article in its locker room all season, just inside the door the Spuds walked by every practice, every game, nearly every day. It was a reminder of how close they had come and yet how far. In one cleansing moment, Oxton tore the newspaper in half. Then with an even bigger grin, he gleefully shredded it into tiny pieces and threw it to the winds. “Now it’s gone,” said senior wing Brendan Johnson of the article. 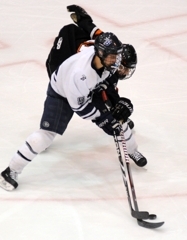 Johnson iced the section final on an empty-netter with 23.3 seconds remaining and added an assist. Now comes time to make new memories for the Spuds, who are back in the state tournament for the second time in three years Oxton wasn’t part of that squad, which finished second to Eden Prairie – the seventh time the Spuds have been to the title game. That and laying waste to a now distant painful memory. 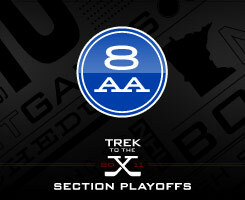 Logan Ness scored just 2:48 into the game and Moorhead made it stand up in a 2-0 victory over top-seeded Bemidji in the Section 8AA final in Thief River Falls Wednesday night. 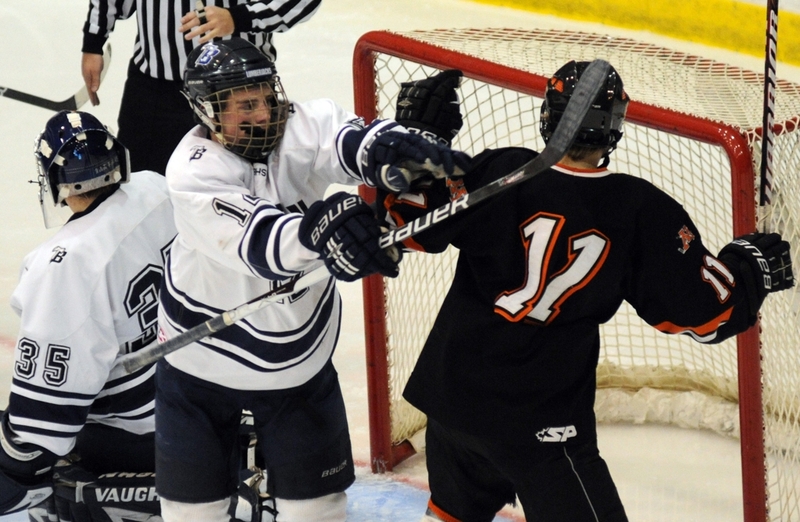 Brendan Johnson iced the game with an empty-netter with 23.3 seconds left for Moorhead (18-7-2), which punched its ticket to the state tournament. Johnson finished with a goal and an assist. 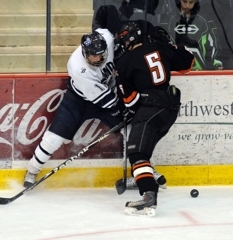 Michael Bitzer made 18 saves for the Spuds, while Jeremiah Graves stopped 24 shots for Bemidji (23-3-2). Graves spent the final 2:03 on the bench as the Lumberjacks pressed for the tying goal, but could not dent the Spuds' defense or Bitzer. With the Spuds protecting a one-goal lead in the final minute, Johnson twice gave up his body to block shots from the point. On the second, he kept his feet and chased down the puck in the Bemidji end, flipping an empty-net goal to seal Moorhead's Section 8AA championship. He also assisted on the game-winning goal by Logan Ness just 2:48 into the game. Bitzer picked up the shutout with 18 saves, although he had plenty of help from his defense, which should share this star. 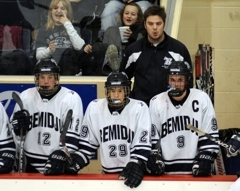 The Spuds rarely allowed Bemidji to penetrate the scoring area and when they did, Bitzer was there to swallow up any shots. He rarely left a rebound. 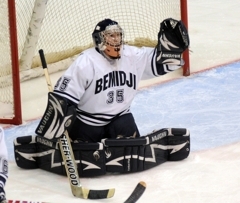 Without Graves in net, the Lumberjacks may not have been in a position to tie the game in the final minute. He made several big stops, including a 2-on-0 breakaway with 16 seconds left in the second and a 2-on-1 break midway through the third. He finished with 24 saves on 25 shots.